No need to switch between the Finance, Billing or Support views of your customers to find the information you’re looking for. SOLID stores all customer and reseller information in one real-time and easy-to-navigate view. Manage both consumers and business customers on the same system. Each contact type contains data fields relevant to an individual or business. All hardware information is stored within the customer record. Automatically assign Account Managers, Sales Managers and Collection Agents all at the customer levels. Enable your Customer Support Team by giving them the information they need at their fingertips. SOLID is a web-based platform available anywhere, at any time, through any internet enabled device. Capture GPS coordinates and they will auto-resolve to GPS locations on integrated Google Maps. Smart view: When you open a customer’s account, all items in progress or areas with recent activity are highlighted – making it even easier to see what changes have most recently occurred. 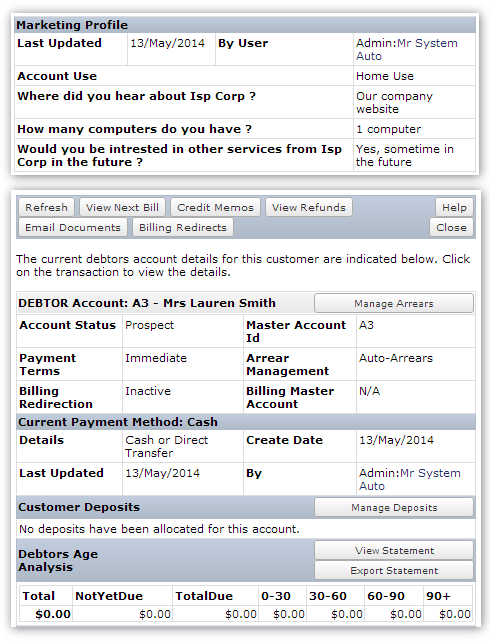 All a customer’s information is contained within a single account view.